I found this "glamorous" ad while going through old papers recently. It is a sobering reminder of the danger of laying up treasure on earth. 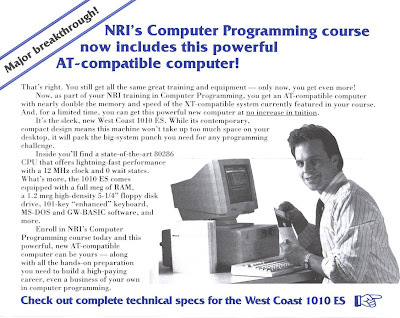 Reading the ad copy, it's hard to restrain a chuckle at the exuberant language used to describe features that today are beyond old. (Click each picture to enlarge it for easy reading.) 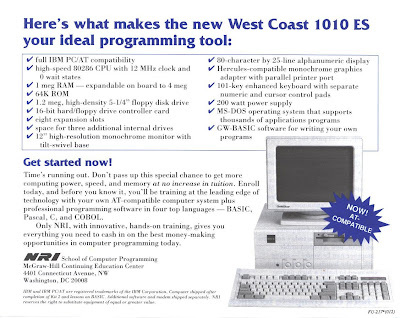 Hard to believe that less than 20 years ago, I drooled over computers like this. Jesus, help me to bank up my treasures in heaven, where they will always keep their value. Free book in Arabic -- that some governments don't want people to have! A few months ago I read a great book called, "God Loves You, My Muslim Friend" by Sammy Tanagho. It was so good that I purchased a whole case of them in Arabic. However, I discovered afterwards that I was moving too fast. I found out that mailing these books into Arabic countries can be dangerous for the recipients. Hence, my decision to give the books away to any Arabic readers that want them. If you read Arabic, and will promise, before God, to read the book, I will mail it to you free of charge, regardless of where in the world you live. What you do with it after you read it is totally up to you. You can throw it away, give it away, burn it, etc! Here is a table of contents of the book. CHAPTER 2: The Muslim Claim that the Bible Was Altered. CHAPTER 4: Did Muhammad Come To Establish A New Religion? SECTION FIVE: Why Was It Necessary for Jesus to Come? CHAPTER 25: Do Christians Worship Three Gods? I use Skype a lot, but recently a friend told me that Paltalk may be better for talking to large groups of people at one time. He said he was recently in a Christian room with 1000 (yes, a thousand!) listeners at the same time. In Skypecasts, you are doing well if you have 30. Paltalk apparently only allows 1 person to talk at time (the host controls who has the mic) so this is not as advanced as Skypecast's ability to have many talk at once. What has been your experience? Is Paltalk a better way to communicate with a large number of people? Does the free version of Paltalk have objectionable ads? If so, how much does it cost to get the ad-free version? How do you fight lust? I frequently find myself in conversations with other young men about how to fight lust. It is a serious battle, and one we cannot afford to lose. What helps you the most in fighting this battle? I'm hoping to eventually compile a condensed list of your most important tips, combine it with some things that God has shown me, and post it here on my blog. For now, feel free to share your answers to this question either via emailing me privately or by posting a public comment to this blog entry. As some of you know, I'm an Area Coordinator for the Voice of the Martyrs, traveling to local churches and Christian groups to share the exciting news of what God is doing in countries where Christianity is illegal or dangerous. I wanted to share two things you might be interested in. First, VOM's Canada branch has produced some really great desktop wallpapers. The one below is the one I use for my own desktop. It is really a reality check. We take it for granted here in the US that Christianity is supposed to be comfortable. Not so. If you'd like to download this or other wallpapers, click here to see the selection VOM offers. Second, God willing, I will be attending VOM's National Conference this June in Bartlesville, Oklahoma. This is held every two years. You can see some of my pictures from the 2006 conference by clicking here. The conference is a great opportunity to hear and meet, in person, people who have risked their lives for Jesus. One of the speakers this year will be Gracia Burnham, who with her husband Martin were hostages of Muslim rebels in the Philippines. If you are not a Christian with kids or ministering to kids, this article may be uninteresting to you. For Christians, there is the perpetual problem of successfully transmitting their faith to their children. The usual pattern is that the first-generation Christians are very zealous for the Lord. The second generation is typically less zealous for Jesus than their parents but retain their parents moral standards. They drop the foundation but keep the structure. In the third generation, the morals begin to slip too. Of course, this "degeneration of the generations" can be spread out over more or fewer generations depending on the individual family. But most importantly, it does not have to happen at all. Michael Pearl has written a fabulous article on this topic. It's aimed at home schoolers -- since I am a product of home education I found it particularly insightful and accurate --but has relevance for anyone who has kids or interacts with kids. Click here to read it. At least 7 of India's states now have "anti-conversion laws" on the books. 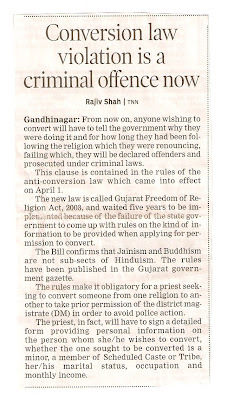 This article was clipped from a newspaper by a friend in Gujarat about the law in his state. Click on picture to enlarge for easier reading. I'm sitting in an arm chair watching Karen sleep restfully this evening while listening to a song entitled "My Father's Love" over and over again. (thanks, Jennifer!) I can't help but wonder if the words of this song are dancing in Karen's heart tonight, too. Today was a really tough day for Karen. The procedure required more time than originally expected because the location of the blockages were difficult to reach, and an additional stent was required. The cardiologist who performed the catheterization said her arteries are highly calcified for someone her age, and the arteries he targeted had to be stretched which caused Karen a lot of pain. Karen's condition is a genetic issue that must now be treated with exercise, a heart-healthy diet, and medication. Our lives are changing. Karen remembers a lot of the events that occurred during the procedure - particularly when the doctor began to use the balloon to open each artery. Her doctor is a very good cardiologist - one of the best in the area. He administered the highest level of sedative he could without using general anesthesia, which significantly increases risk. So, he took very good care of her. However, the memory of the procedure is really hard on Karen - and she was shaking and sobbing when I was able to see her after the procedure. Did God hear our prayers? Absolutely. Why did He allow her to experience so much pain? I don't know. "Why" questions are best addressed with "Who" answers - and the answers are derived alone from the infallible Word of God. And I know this... God is absolutely good and perfect and holy - and the cardiologist had a Friend guiding his hands. Karen had many friends loving her through prayer. She had a Father watching single every move, holding her heart in His hands, and providing His grace - grace sufficient to endure a traumatic process that brings healing to her body. Later this evening when she was able to hold a conversation, Karen said, "I can't understand how Christians persecuted in other countries can endure so much pain, and they don't have medication like I do." To live the Christian life - His life - requires nothing less than the grace and power of God. Anything else would be a "filthy rag" existence. God works through us as an instrument of His mercy and grace. When we pray, God's mercy and grace is actively working through us. His love is expressed. He does things we can't. We allow ourselves to become intimately involved in God's unfolding plan - exalting the Living God. Speaking of exciting, Karen might be able to come home from the hospital tomorrow. After spending time recovering and gaining back her strength, she will have a lot of catching-up to do. We've received a lot of email. There is only one reason why your email has not been answered (yet) - Karen wanted to do that herself. But in the meantime, please know they have been read to Karen - and your personal words of kindness encourage her; they encourage me. Your cards, flowers, email, food, calls, etc. are a blessing to us. We thank the Lord for you all. "My Father's love is strong and true - always believing, always seeing me through. So no matter what happens in His grand design, I'll be fine with my Father's love." Last Friday night and Saturday my Dad and I had the blessing of attending a short but excellent seminar taught by Jeff Noblit, from Anchored in Truth Ministries. Dr. Noblit pastors a church of about 1000 in northern Alabama. One of his "Timothys" pastors Village Park Baptist Church in Sedona, where this seminar was held. You can read a bit about Jeff Noblit's background and why he is different from most pastors in the US on this page of his site. The first message, "God helps those who cannot save themselves", is based on Romans 5:6-10. It is an excellent joy-inducing explanation of how sinful we really are, and how gracious God is to even mess with us. Even though I have heard most of this stuff before, for some reason I love to be reminded, and to see new glimpses of God's incredibleness. Dr. Noblit used some very helpful and memorable illustrations to make it easier to understand. The second message, "The Law -- it cannot save" is based on Hebrews 10:1-4. In it, he explains how our natural tendency, like Cain, is to present our works to God and expect Him to accept us because of them. How foolish! Our works are all tainted by our sinfulness. It's like using dirty water to wash the floor. The third message, "The invitation" is based on Isaiah 55. In it, he balances out the "divine sovereignty" aspect of being saved (which he had focused on heavily in the first two messages) with the "human responsibility" side. What is our part in receiving reconciliation to God? Even though you may think "I know all this stuff", the way Dr. Noblit explains stuff is different from the way most US pastors do it. There are important reasons for this. The fourth message, "The Bible Driven Church" is based on Matthew 16:13-24. Dr. Noblit shares the "purpose statement" he formulated for the church he pastors, and how each part of it is based on Scripture. It gives a lot of helpful insights about how the church should be focused and structured.